Lynn Gee & Brian Cockrell visited the Rotary E-Club of South Africa One, Durban to make a contribution to Project Dignity from Liverpool Exchange Rotary Club. 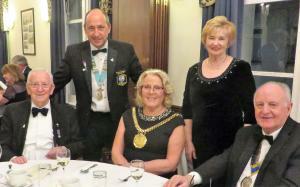 Dr Tony Robinson, DG Steve Martin, Lord Mayor Christine Banks, Linda Chase and President Vic Chase. 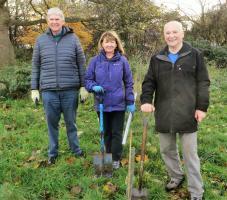 Lesley and Alan Webster and Brian Cockrell planting trees at Sudley Estate. Rotary Change-Over Dinner June 2018. 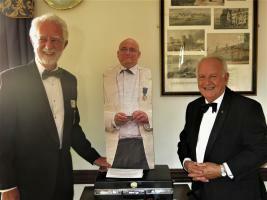 President Vic Chase, Treasurer Harry Taylor and Immediate Past President Matin Hudson. 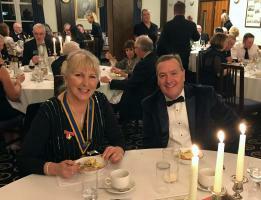 The 2018 Charter Night of the Liverpool Exchange Rotary Club was held on Friday 23rd February at the Athenaeum, Liverpool.